Completely revised and updated, this 4th edition of Uprooting Racism offers a framework around neoliberalism and interpersonal, institutional, and cultural racism, along with stories of resistance and white solidarity. It providers practical tools and advice on how white people can work as allies for racial justice, directly engaging the reader through questions, exercises, and suggestions for action. 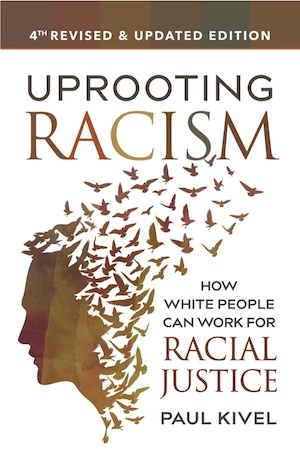 Previous editions of Uprooting Racism have sold more than 50,000 copies because it is accessible, personal, supportive and practical – ideal for students, community activists, teachers, youth workers and anyone interested in issues of diversity, multiculturalism and social justice. "Uprooting Racism is a uniquely sensitive, wise, practical guide for white people struggling with their feelings about race." "Uprooting Racism gives the student, activist and practitioner something for their social justice tool box. The expanded edition is challenging, informative and practical. You'll finish the book and want to get right to work." "As a woman of color actively engaged in social justice movements for over 25 years, I have often longed for a book like Uprooting Racism to help white people understand the institutional, systematic, and persistent character of racism in our world. Paul Kivel has written a handbook to critically examine racism in our lives, and in our work for peace and justice." "This book provides the best concrete guidance for the new or perplexed would-be white ally that I have ever seen in print."